Since I started climbing in 2006, I’ve been blessed to have the opportunity to climb in so many spectacular different settings – from the sharp-angled limestone of El Potrero Chico to the steep, intimidating granite on the Chief in British Columbia. However, one of the more interesting scenery came from an unlikely place – Manchester Bridge in Richmond, Virginia. 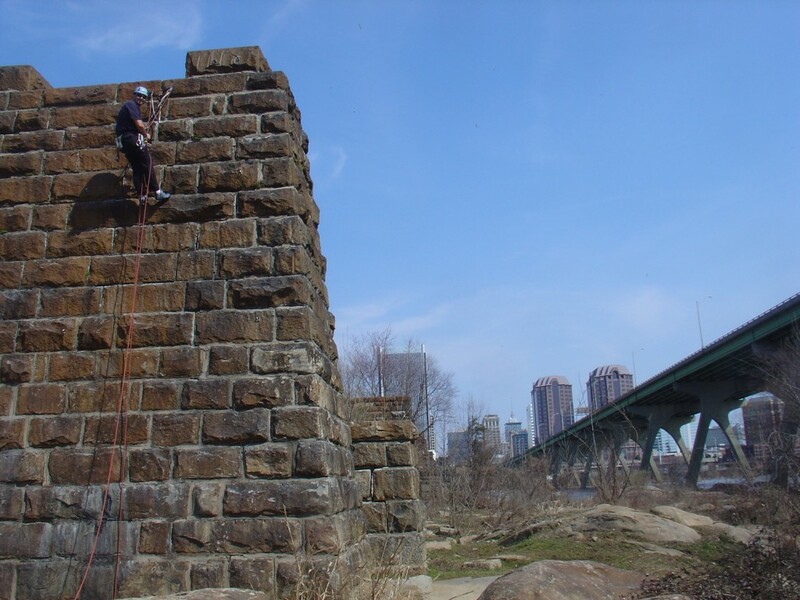 This climbing area is right in the middle of downtown Richmond, and is basically a series of abandoned train trestles that have been equipped with bolts and shutts. I like how this picture shows that you can find a corner of earth to recreate in anywhere – even in the most unlikely of places! You may not live in a mountain-top log cabin overlooking a field of wildflowers filled with deer every morning…but that doesn’t mean that you can’t find a patch of natural green space in which to revel in the wonders of Creation. Parks, greenways, gardens, maybe even your own backyard – even in a big city its not hard to find some outdoor enjoyment! So what about you? Do you have an unlikely go-to spot that you use to get a mid-week nature fix? Brandy, we’ve only been there once, and it was many years ago. We had only been climbing for a few months, and we were looking for moderate sport routes (which pretty much are non-existent in NC…) Its definitely an interesting place, worth going to once for sure I’d say, but the climbing is just okay. Yes, you’re climbing “outside” but its not real rock, so it tends to have kind of an “outdoor gym” feel. But for practicing lead climbing skills on routes that have bolts VERY close together, it was great! Especially if you happen to be in the area it’s worth a stop. I love this post. It really is an awesome experience to be in a setting such as that, and so near the hustle and bustle of the urban sprawl. I was able to do some (rather tall) trestle climbing in Fayetteville NC that was over a large muddy river and in the center of town. Pretty cool… Sometimes the next great adventure is right next door. When work is hectic and I need to break up the monotony of the day I like to go for walks around work campus, all i need is the sun, the brids chirping and the restless squirels for ease. Or I like to walk my dogs around the neighborhood, I find it enjoyable to see them marvel over smells, squirrels and bunnies. Thanks for all the great comments guys! This is exactly the sort of discussion and interaction I was hoping to develop! Keep it coming! My mid week escape is the traverse/ bouldering/ support wall by the gym at school. It’s not much but it’s a great escape! Also very cool to finally see a picture of this place! I am somewhat of a Manchester regular. I try to get there at least once a week. It’s a unique place. While most climbers would not consider it a destination, I’m glad you did and gave it some recognition. I’ve only been climbing a little less than a year, and that place has been an invaluable training tool. For east-coasters of Virginia like myself, the nearest “real” outdoor climbing venues are three hours away. There is virtually no other spot within 200 miles where one can hone their skills of leading, both trad and sport, rappelling, and self rescue. Some of what makes it so unique is that there is this big sprawling urban environment all around it. It was actually a little intimidating the first time I went there. It was my first time out of a rock gym and standing there looking up at a virtually sheer 60 ft granite block wall was awesome. Some of the things the guide doesn’t mention: The main wall has ridiculously convenient access; the left side has a path, and the right side actually has a maintained set of steps (please, when setting up a top rope rig, even though it seems relatively safe, anchor to something). The main wall is like a pyramid, the further you move toward the center, the higher it gets so the climbs vary from 5.7 to 5.10b and from 20 to 60 feet. Choose your adventure. The piers (there are three, but the base of the third is under water unless there is a drought) are all roughly 35 feet in height. All the routes on the piers must be led, as they are pillars and there is no top access. The majority of routes at Manchester are bolted and most have double top anchor bolts. Some of the bolts have clearly been there for some time, and are in need of replacing, so please use caution and examine what you’re hooking into. The guide also gives poor directions for locating it, and parking. There is actually a public parking area under the bridge that the area is next to. It’s tricky though because you have to drive through a railway station to get there, and they have “no trespassing” signs posted. I’ve never had a problem, and I’ve even talked to a few employees there that say those signs don’t really pertain to people accessing the climbing area, as there has never been any type of conflict. I’ll try to describe it as best I can. First, get a map (detailed directions from the start are horrendous). Locate Semmes Ave. Follow that in a northeasterly direction until you hit W7th St. Take a right onto W7th. Pass Legend Brewing on your left, and then take a left on Perry St. This will bring you into the railyard, and a stop sign. At the stop sign, take a left. Drive straight, be mindful of the railworkers if any are present, and obey the really low speed limit of like 5mph or something like that. Cross the tracks, and follow the fork in the dirt road (it turns to gravel after the tracks) to the right. The road will curve to the right; it’s only small enough for one car’s width, but it opens up to a rather ample parking area directly underneath the route 60 bridge that goes over the James. Normal ethics apply. There are plenty of routes there; most are from the lower to the upper side of the moderate scale, with a few easy routes sprinkled in. I’ve never had to wait to hop on a route I wanted to try. Expect to be ogled and viewed by runners, hikers, tourists, and passersby because this is a scenic area and part of a path that runs along the floodwall of the James River. Hope this gives a better idea of the place, and as a local, I welcome any and all climbers to check it out and pull down on some granite. Hey guys just doing some rest day reminiscing-I actually lived at Manchester for a while before I moved out west. Used to park behind Suntrust building (probably a different bank owns it by now), walk down to the second pillar, solo up the 8ish crack on the river side in the dark, haul up a pack on a shorty piece of rope, make some dinner on the old Pocketrocket stove, stretch out in the old sleeping bag, watch the stars and listen to the river run as I fell asleep. Not reccommended safety-wise; I used to hear crackheads doing what crackheads do sometimes late at night, but most of the time it was a pretty pictureque and bizarre urban camping spot with a really nice setting. I would caution against parking underneath the bridge (past Legend Brewery, same elevation as the base of the wall-I got broken into by ghetto kids and know a lot of others who had the same experience. Cops patrol the upper road by the bank building and there tends to be runners going by often-both good deterrents. In really dry years you can walk through the muck out to the third pillar and so on, but most ascents take place by boat and are semi-solos or gear routes. Good luck!